Posted on 16, December 2015 by EuropaWire PR Editors | This entry was posted in Art & Culture, Entertainment, Germany, Media and tagged 66TH BERLINALE, Berlinale, EFM, European Film Market, Matthijs Wouter Knol. Bookmark the permalink. BERLIN, 16-12-2015 — /EuropaWire/ — As the first film market of the year, the European Film Market (EFM), part of the 66th Berlin International Film Festival, will open its doors on February 11, 2016. The exhibition spaces at Martin-Gropius-Bau and the Marriott Hotel at Potsdamer Platz are already fully booked. In 2016, more than 8,000 producers, exhibitors, world sales, buyers and financiers are expected. The EFM is one of the most significant platforms for trade in international film rights and audiovisual content. As the first industry event of the year, it is a compass for the newest developments. Following their successful introduction last year, various new initiatives such as the “Drama Series Days”, “EFM Asia”, “EFM Startups” and the “EFMProducers Hub” will be continued in 2016 as well. “Our new initiatives are an appropriate reaction to the development of and great changes in the international film and media landscape. The positive resonance last February confirmed our intention to increase these offerings within the Market’s activities,” says Matthijs Wouter Knol, EFM Director since 2014. “This year as well, we are concerned with offering our exhibitors and participants the optimal environment, as well as opportunities relating to infrastructure and content”, says EFM President Beki Probst. On February 15 and 16, theEFM, the Berlinale Co-Production Market and Berlinale Talents are again organising the Drama Series Days with panel discussions, market screenings and various networking events and, curated by the Festival, a selection of high-quality drama series within the framework of the Berlinale Special Series. The premiere edition of this event, in February 2015, proved very popular with the international film and television industry. Building on this, high quality documentary series will make their debut as part of the “Drama Series Days”, 2016. Once again, the initiative’s partner at the EFM is the Film- und Medienstiftung NRW, in addition to which HBO Europe and the Medienboard Berlin-Brandenburg are supporting the “Drama Series Days”. 38 state-of-the-art cinemas are at the service of market participants for screenings. A new development is a mobile cinema, the EFM Cinemobile, which seats 80 and offers digital screening possibilities outside Martin-Gropius-Bau. A further new offering, also having its premiere next to the Martin-Gropius-Bau, is the joint ASEAN (Association of Southeast Asian Nations) stand. The ongoing partnership with the Bridging the Dragon network complements the EFM‘s bridgehead to Asia. Making its first appearance on February 17, there will be a Sino-European Seminar, at which 35 selected European producers will spend a whole day with Chinese experts in order to gain a deeper insight into the Chinese market. 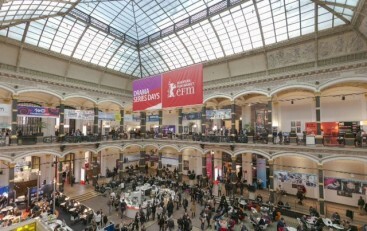 The “EFM Producers Hub” is being expanded this year and, over six days on the 2nd floor of the Martin-Gropius-Bau, offers space for meetings and advisory sessions as well as, in yet another new offering, also daily short talks on innovative themes specific to all aspects of production. “EFM Startups”, yet another initiative introduced last year, breaks new ground this time when European startups with new audiovisual business ideas have the opportunity to establish contacts with the international film and media industry. The startup companies are represented on their own stand in the Martin-Gropius-Bau for two days. “EFM Startups” is supported by the Medienboard Berlin-Brandenburg and Startup Germany e.V. At the EFM Industry Debates (February 13 to 15) international experts will again discuss current perspectives of the film and entertainment industry. The three panel discussions in the Gropius Mirror Restaurant are organised in conjunction with Screen International, The Hollywood Reporter and Variety. Official partner is the IFA, world’s leading trade show for consumer electronics and home appliances. Together with the European Documentary Network (EDN), the EFM is again presenting “Meet the Docs”, a networking platform dedicated to the international documentary film industry. There will be various panel discussions, pre-booked one-on-one meetings with international documentary film festivals, project consultation and networking events, all in the Martin-Gropius-Bau. The cooperation with Berlinale Talents continues in 2016: At the “Berlinale Talents Market Hub” – in partnership with the Verwertungsgesellschaft der Film- und Fernsehproduzenten mbH (VFF) – ten selected professional distribution and world sales talents will have the opportunity to present themselves at a joint stand in the Martin-Gropius-Bau. Under the “American Independents in Berlin” umbrella, independent US filmmakers come together again in the Martin-Gropius-Bau – organised by the Independent Filmmaker Project (IFP) and the Sundance Institute. The latest independent productions will be screened in the “Sundance at EFM” and “IFP Selects” sections. LOLA at Berlinale spotlights the best in the German film year 2015 by presenting feature films and documentaries long-listed for the German Film Awards (aka Lola) by the German Film Academy.